Do you love Christmas as much as me? It allows me to get creative and crafty. I have doing DIY projects especially at this time of the year. One of the things I love are free Christmas printables. I even have a Pinterest board dedicated just to them. There are so many projects you can do from creating that next great piece of wall art, to Christmas ornaments to gift tags. Some of my favorite bloggers even design great projects that you can download for free. Some of my favorite Christmas printables are below. Now you will have to visit each of their blogs for the downloads but you can get some inspiration right here. 2. I simply adore this Santa printable about believing from Less Cake More Frosting. 3. I love Chalkboard art, so love what DIY Swank created. 4. Can I share with you how much I love Christmas movies, so I was super excited when I found Christmas movie quote gift tags at The Happy Tulip. With all the printing I am doing at this busy season, one thing I don’t want is to run out of ink. You have to hate when you start a project and can’t finish it because you have no ink. Remember back earlier this fall, I told you about the HP Instant Ink Subscriptions? With an Instant Ink subscription you never have to worry about running out of ink. How does it work you ask? Your HP printer does the work for you, at least my HP Envy 7640 does. New ink cartridges are shipped to you whenever you start to run low on ink, how sweet is that. There are various monthly plans that you can choose from. What you choose will depend on the number of pages you print each month. Plans start at $3.99 a month. Everything is included n the monthly cost of the ink, even shipping and recycling. You can learn more about the HP Instant Ink subscriptions here. Think of all the headaches you might prevent. Now, tell me are you like me and love to create at Christmas time? What are your favorite projects? To help celebrate the Hallmark original movie North Pole, it’s on next on December the 12th, Hallmark created the Northpole collection. Because I am a member of the #presspause panel Hallmark Canada sent me a box of goodies to checkout. For us every year we have built Christmas traditions and one of them that we have done always over the years has been holiday baking. Rachel was delighted even as a big kid to see the Bake like an Elf, the Sprinkle bell, the Cookie Maker and the cookie taker. She loves to bake and she immediately claimed the Cookie Maker apron as her own. There are several very kid friendly Christmas recipes to try out, really something for every taste bud. Since Rachel’s school is having a bake sale this week at school, it was time to get to holiday baking. She had fun in the kitchen and now we are almost ready for the Thursday bake sale. We always bake for others every Christmas, its a tradition we started years ago. If baking with kids in a tradition for you, this might be fun..if it’s a new one you are thinking of these baking items are great for young kids. Two of the other things that were in the box that delighted Rachel, were the Snowby polar bear holding a snow globe. Rachel is a snow globe collector so she quickly claimed that as well. She also thought the Find me Santa ornament was adorable. Looking for something fun for the kids try Dance with the Kids, or the Northpole Communicator. They can dance like an elf to songs like Build a Snowman or Stir the Hot Chocolate, or talk with Santa and the elves via the Northpole Communicator. We are sending these two to family members with young kids. The Rooftop Drop Game has been giving us a bit of fun around the house. 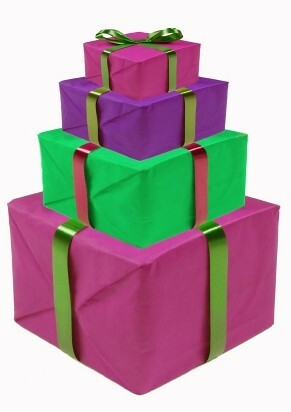 I think I am better at dropping gifts, maybe its the natural klutz in me. If you are interested in learning more check out the Northpole 1820 website. You can buy items there are at you local Walmart. Rexall, Superstore or Hallmark stores. *I am a member of the #presspause panel and as such I do receive product in exchange for a post for Hallmark Canada. My opinion is my own as always. Every holiday in our family there is always an influx of entertaining to do. When I was younger we always had a huge gathering around the tree. Then when Rachel was wee little and my dad was alive, Grandma’s house was the place to be. From my grandmothers and my own mother I learned some frugal tips that made holiday entertaining easy and frugal. First and foresmost these women had it down to an art form, there were traditions, always made fruit cake, and cookies, and unexpected company was the norm. So how did they manage and stay on budget? 1. For the big events they delegated, family and friends brought a dish or two. It is okay to share the workload. 2. When it came to drinks, they kept it simple, they did have a bar, but they also made sure there was plenty of non alcoholic punch available too. My mom was making mocktails long before they were called mocktails, and her recipes are the best.I have a number of great mocktail recipes on my Pinterest board. 3. They used paper plates and the like sparingly, this was the time to break out the good china, I remember my grandmother’s set, it sat in the china cabinet except when there was company and then it came out each and every time. 4. How about instead of the party where food is featured have a cocktail hour, a dessert only party or how about a brunch instead? 5. For invites, you can send them electronically using a tool like Evite. Think no postage. 6. For decor think about natural elements, we especially loved to use pine cones at this time of year. What are some of the ways you can think of to save on holiday entertaining? 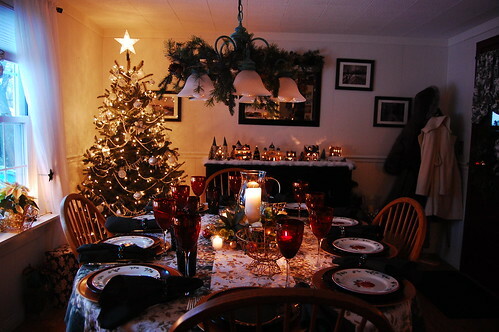 Let me know or better yet join us on Twitter Wed Dec 5th from 7-8pm EST as we chat holiday entertaining on a budget. So how do we get through the holidays and really not have a shopping hangover? 1. Set a Budget – Decide ahead of time what can be spent. By knowing how much you have to spend you can have much less stress in your life. Know this figure. Remember some of the best presents are simple, thoughtful and sometimes even free – ie the gift of time is often a much appreciated gift. 2. Make a List, Check it Twice– By making a list of the people you plan to buy for this season, it can help you stop you from overspending. Set a budget for each person. If you have a large family suggest drawing one name, or shopping just for the kids. For friends suggest a games night (make it a potluck) and simply spend some time together over the holidays. 3. Avoid the Deal Sites – Deal sites can tempt you to buy things you wouldn’t normally buy just because it is at a reduced rate. There are many a fabulous deal but remember if it wasn’t already on your list it is simply a temptation that will take you off track. The holiday season doesn’t have to be a stressful time for you, simply set a budget, make a list, check it twice, avoid the the deal sites and enjoy time with family and friends. Now if you are shopping for a cell phone and plan for someone on your list one way to save is to check for deals before you buy. Mobilicity has some great deals this Christmas that you may want to check out. *This content was brought to you by Mobilicity. With no contracts or hidden fees and year round unlimited data, talk and text, Mobilicity is about providing a better wireless experience, not an expensive one. Visit Mobilciity.ca to find out more! Here in Toronto this weekend we have the Santa Claus Parade. With the parade in sight we really have the start of the holiday season. So my question is this: Have you set your holiday budget yet? Know how much money you have to spend and stick to it! Really it is that simple. List those who are on your shopping list, along with ideas and the budget for that person. Nothing gets to me more then watching a family put their holiday shopping on a credit card and not paying the balance at the end of the month. Make this a cash holiday. Throw your credit cards in the freezer and don’t use them for the holiday. Instead of having an office holiday party, how about a day of company service? Organizations like a food bank or organization that hands out toys can always use a helping hand. If you are like me and have a huge family their is a way to solve the money crunch that can come. Shop for the children of if their are too many draw names and spoil just one. For the adults automatically do the name draw, simple solution that just makes sense. I love when I receive a handcrafted gift. If your budget is tight think homemade. Pinterest is full of do it yourself projects that would make a perfect gift. In the past I have done apple sauce, cookies or homemade chocolates. Do you have a tip that helps keep you sane and on budget during the holiday season? Do you enjoy looking through those old Christmas albums? I do as I reminisce about Christmas’ past and family traditions. We have a number of them. My favorites pajamas worn Christmas eve are a new pair that had been opened that eve and the reading of Twas the night before Christmas. It is that time of year again, and as we tackle everything else this year we have to think of the teachers and others who need a small gift. A token of appreciation. Every teacher including me , has had enough chocolate, enough mugs, enough ornaments..so what can you and your child do together that can be frugal, fab and thoughtful. I have some ideas. We love giving gifts in a jar. They are easy to make and always appreciated. Sand Art Brownies are a great easy to make recipe. Layered cocoa, brown sugar, chocolate chips and pecans make this Mason jar recipe extra-special. I would just say it is yummy. Classic Cocoa Mix is a wonderful treat. For me it brings back many a memory. 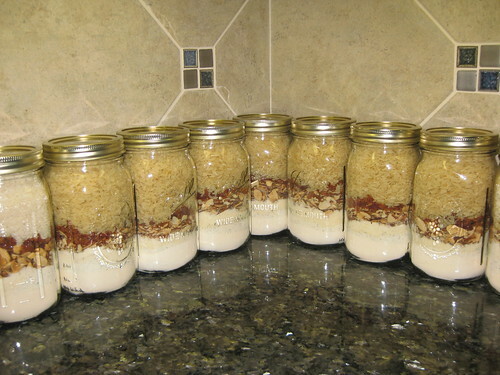 Apple Pie in a Jar is another classic treat. Think traditional. Sugar Cookie Mix another traditional Christmas classic. When you are thinking of gifts for teachers. Think consumable. Remember it is to show appreciation for the job they are doing. Make cookies or maybe even brownies, place in container that they can keep. I am sure you can think of many ideas. Please do share with me, what you are planning on giving to the teachers around you this year. Well it is that time of the year, Halloween and Eid are around the corner and Christmas is not far behind. The holidays are here! So how does one get ready for all these holidays and not break the bank? For us it has never been about the amount of money we spend. It has been about creating time honored traditions and looking for opportunities to serve others. Make sure we keep reciepts and if buying right before Christmas check for reduced prices within 2 weeks of purchase, often they will give you the sale price. We also look for chances to serve. In past years we have participated in food drives and sorted food and toys at local food banks, prepared shoes boxes to send to children overseas, chosen to adopt a child from overseas, adopted animals, cleaned up a neighbours yard, and shovelled snow for those who couldn’t. There are many ways that you can find to serve and often time is the best gift you can give. Homemade: one year I made soup mixes and put them in old fashion canisters I got for a $.25 each, another I made hot chocolate mixes and put them in mugs I got for $.50, another I got frames and decoratedthem with buttons and other nicknack’s. Cookies with recipe card attached. Git Certificates you made yourself for services you can do : ie gardening, sewing, babysitting, cooking , game time, reading, really the list is endless for this one. a treasure box: get a small box at craft store: fill it with treasured notes ,etc.. So for me it just makes sense to do it with cash and creativity, that way you really can enjoy the holiday no matter which holiday it is with less stress. 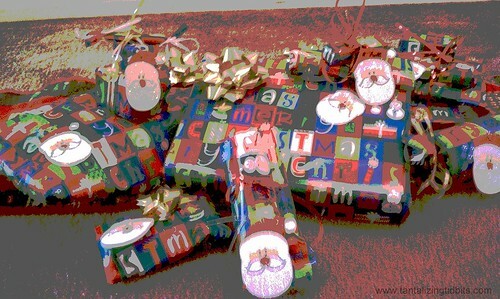 A couple weeks back I shared how we were going to have a frugal Christmas. Today I wanted to share some pictures of our Christmas. Christmas Eve Day My mom and I visited MySalon in Dartmouth. Great little hair salon owned by my sister. She gave me a color and cut as my birthday gift. Christmas eve tradition the opening of one gift..always pajamas and this year there was a bathrobe and slippers in the box too. Christmas morning my tween made breakfast, and it was yummy: waffles,strawberries and whipped cream. After opening presents at my house we headed to my sisters and there there were more! Christmas dinner ended with me having to blow out one monster candle as I turned 45! After dinner headed to the movies and saw Up in the Air. Here we are waiting for my tween daughter and her uncle who decided to see Avatar instead. I think they saw the better movie. And that was our frugal Christmas. I hope you had a good time with family and friends this holiday season. Lets try and share that holiday magic with us each day of the year.